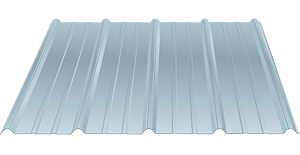 ABC's Imperial Rib Metal Roofing Panels - Goosebay Sawmill and Lumber, Inc.
American Building Components’ Imperial Rib® panels are formed from high tensile strength, 29-gauge steel, which is protected with a Galvalume® coating. The state of the art Millennium 3000® paint system is then applied, providing years of warranted protection from the color coated panels. Refer to ABC’s published color chart to select any of our many contemporary colors. 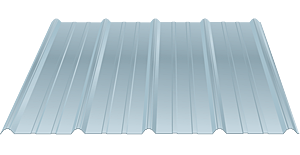 Imperial Rib® is manufactured for your application and is available in cut-to-the-inch lengths. UL 280 rating is available, as well as UL 790, Class A for external fire, roof assembly for UL 263 for internal fire and the UL 2218 Class 4 impact rating. Condensation Control with Drip Stop: When the temperature and humidity conditions reach the dew point, moisture can condense on the underside of metal roofing. This condensation has the potential to cause water damage and other problems inside your building when left exposed from the underside of the panel. Drip Stop Solutions: Drip Stop technology is a unique solution for protecting your assets through condensation control while maintaining the aesthetics and structural elements that ABC’s roof and wall systems proudly offer.